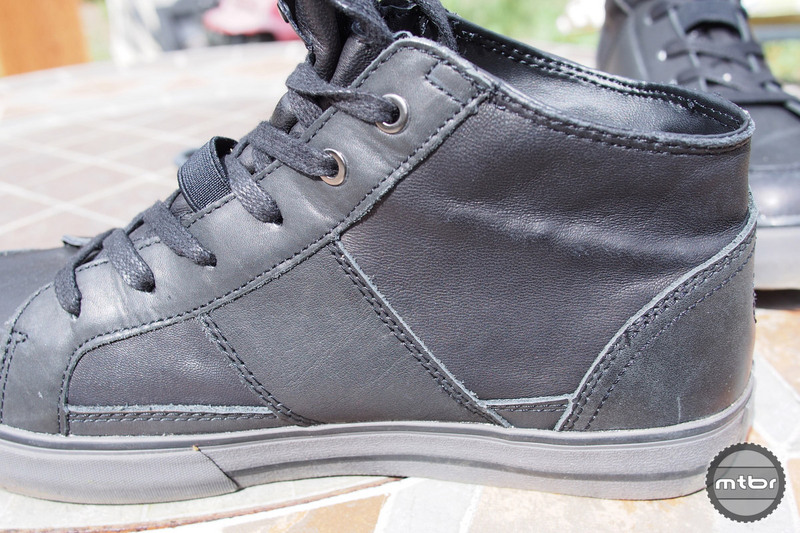 The mid-top shoe looks good from all angles (click to enlarge). DZR is a San Francisco-based shoe maker with a new offering that will keep you dry during your next rainy, damp or snowy commute. 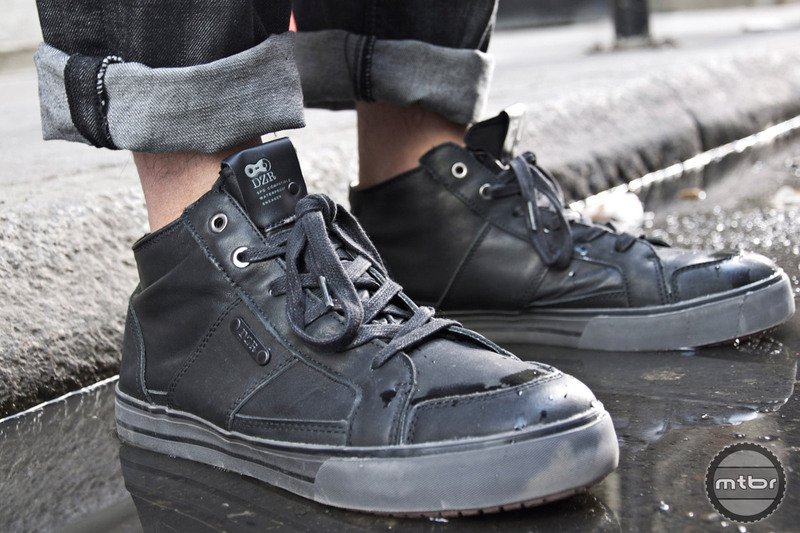 Meet the DZR H2O, a fully seam-sealed waterproof SPD compatible sneaker. Wrapped with DWR (durable water repellent) treated sheepskin leather that’s very supple to the touch, these $169 shoes feature a stiff metal-reinforced nylon shank and gum rubber traction outsole. Power transfer is efficient while grip on all surfaces is excellent. 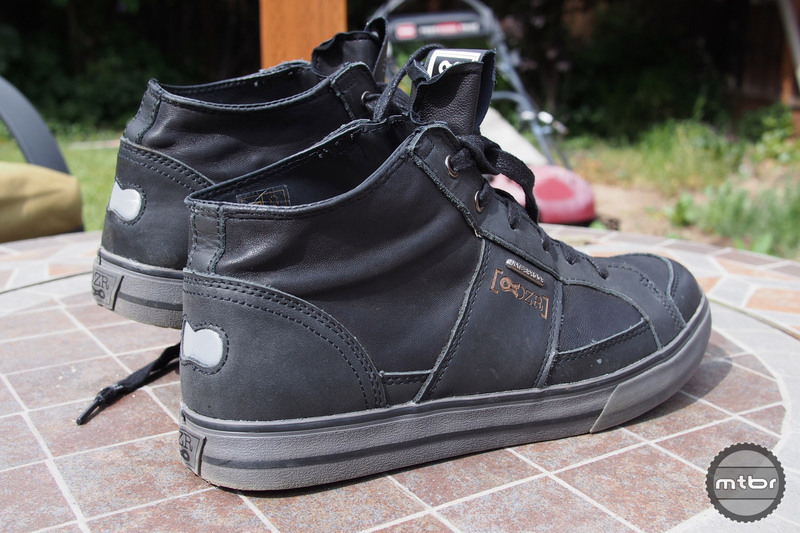 We were impressed by the quality of materials and build of the shoe. The sheepskin leather is nicely sewn in with an inner lining that produces a comfortable, seamless build. We loved the outer sole that featured chainlinks to produce an attractive design with ample grip on any surface. Great grip in wet conditions is an asset (click to enlarge). 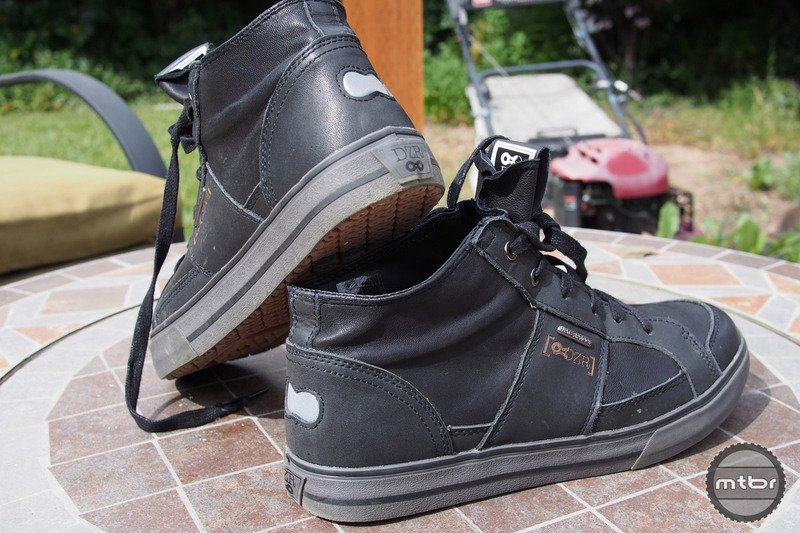 Being a waterproof SPD shoe, it’s not your ordinary mid-top shoe as it’s heavier and harder to get in and out of. 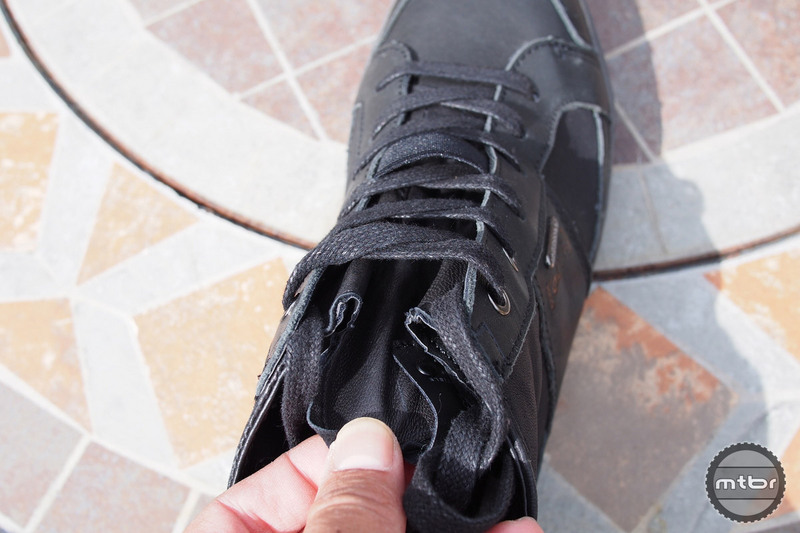 The tongue of the shoe can’t just be shoved out of the way so the laces need to be loosened sufficiently. And leaving the shoe slightly loose was not ideal either as we experienced heel lift while walking or pedaling. So extra care has to be used to put the shoe on and off. But used properly in its element, it performed well. It’s a little harder to walk on since the sole doesn’t bend as much due to the shank for the SPD cleat. So make sure you want to use SPD cleats if you’re buying this shoe. Otherwise like us, we’d much prefer to be commuting on flat pedals with wide platforms and shoes that are easy to walk on. But DZR has a wide selection for all those options and these same qualities can be found in their other models. 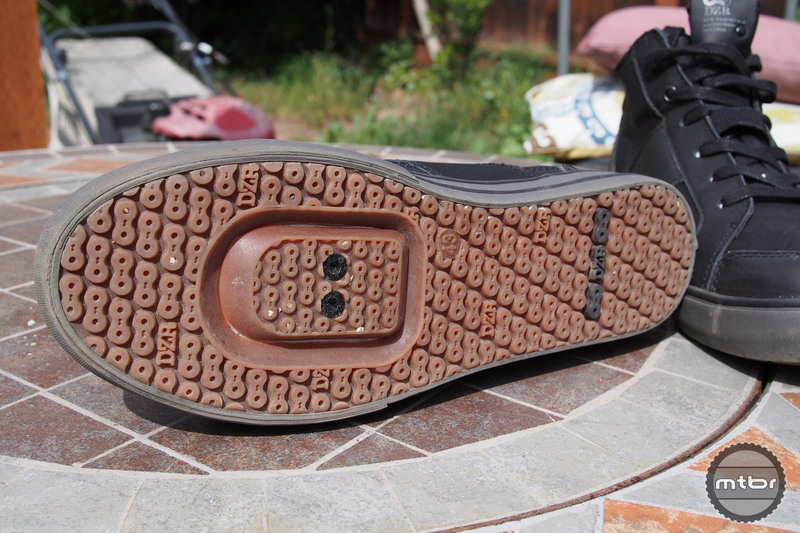 The shoe tongue is one-piece molded to prevent water from getting through (click to enlarge). Other highlights include elastic lace loops that prevent your laces from getting caught in your chainring. This shoe features full grain sheepskin leather for durability that handles scuffs in stride and it ages well. Finally, a reflective heel badge to enhance rider visibility when around vehicles or street lights. The sole is very grippy and it is SPD compatible (click to enlarge). The H2O is part of the DZR Street Collection, which is designed to embody the spirit of riding in the city while pushing the limit of what a traditional biking shoe look and feel like. 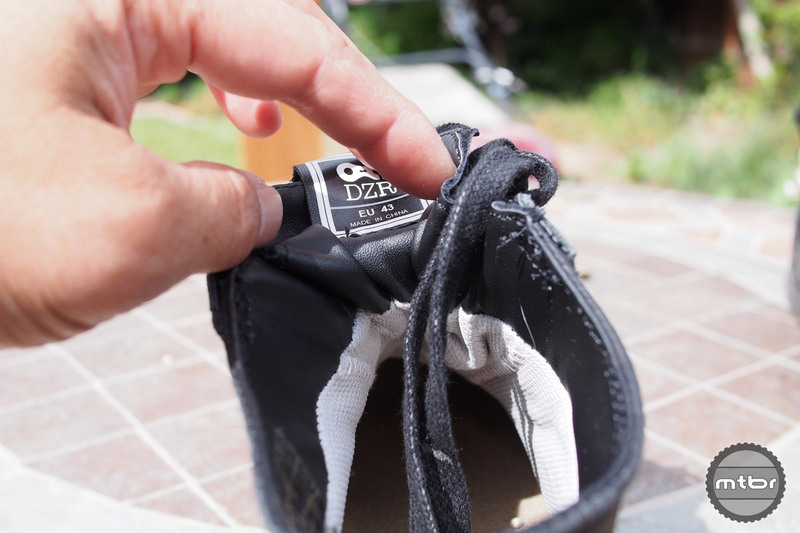 Even if this is not the shoe for you, check the broad line for different options and price points that use the same DZR grip sole and employ the same shoe build values. For more information visit dzrshoes.com. Great grip in wet conditions is an asset. 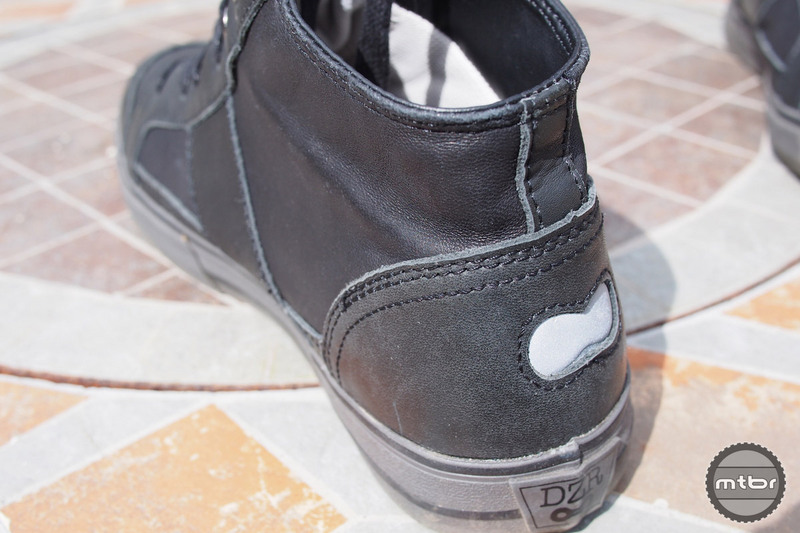 The DZR H2O shoes are well insulated from heavy rain and puddles. The DZR H2O sports a nice reflective strip for visibility. The mid-top shoe looks good from all angles. The front of the shoe is well supported and protected from commuting perils. The sole is very grippy and it is SPD compatible. The rear reflector is designed in the rear logo. Lace holder keeps the lace ends in place. The shoe tongue is one piece molded to prevent water from getting through. The tongue is a little harder to get out of the way since it is integrated for water protection. I’d like to see something more than a product placement faux review. “Needs a non-SPD version for commuting” — what? That’s *any* shoe. You didn’t say anything about fit. Is it a perfect Brannock fit? 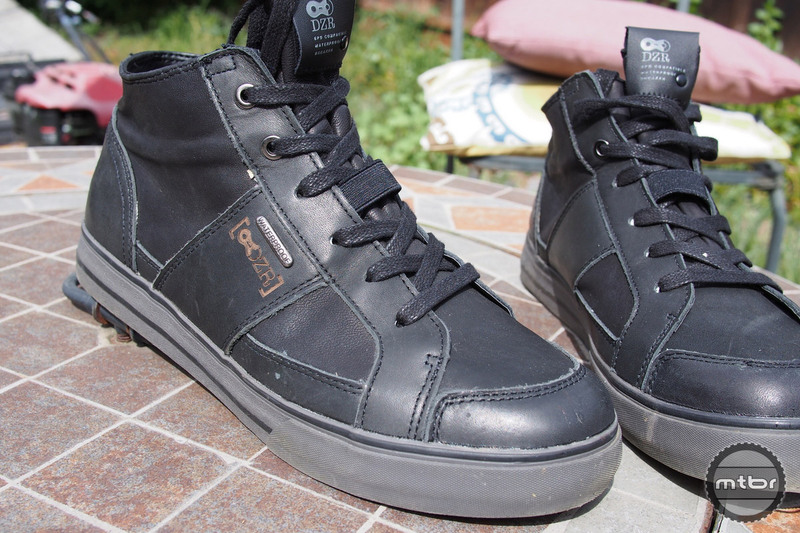 Compared to most street shoes is it… Narrow/wide? Short/long? Big/small toebox? High/low instep? More/less arch support? Loose/tight heel? Thanks. These shoes are awful. They are really cheaply made and cost a fortune. There is no customer support either. Check their Facebook page ratings and comments to see what I mean. I was fooled by the looks of these shoes which is great, but all that glitters is not gold. Agreed. Heel is so hard and uncomfortable. Style over substance.